The stunningly beautiful Bay of Mirabello, and the island of Spinalonga, will be familiar as the spectacular setting of ‘Who pays the Ferryman?’ and, more recently, Victoria Hislop’s novel ‘The Island’. But Cretan landscapes are much more than that – with olive groves, vines, sandy beaches, spectacular mountains and picturesque fishing harbours, all carrying tales of a fascinating history and offering, just as importantly, warm hospitality. Crete, specifically Phaestos, is home to Europe’s oldest civilization, that of the Minoans. Subsequently Romans, Venetians and Turks are an important part of Cretan tradition, too. This two-centre holiday will show you a wide variety of scenery and visits, and all within very reasonable travel distances. Day One: Flight to Heraklion. 20-minute transfer to your hotel in Gouves for three nights half board accommodation. Day Two: At leisure in Gouves, or you can take an optional excursion in the afternoon to see the ancient ruins of the Minoan Palace of Malia. Day Three: Full day excursion to the Gulf of Mirabello. This fabulous day begins with a trip through the spectacular St George ravine to the village of Kritsa, a whitewashed mountain village with brightly-coloured doors and shutters, famous for its woven handicrafts and its Byzantine church. You then continue to the picturesque port of Agios Nikolaos. Here you have free time over lunch to stroll around the Marina and Lake Vouliagmeni. Your trip continues to the town of Elounda from where you take a 20-minute boat trip across to the Venetian fortress island of Spinalonga which was a leper colony for the first half of the 20th century. After a guided tour of the island, you return to your hotel. 72 miles today. Day Four: Today you leave for Rethymnon in the west. First stop today is the remarkable Eleftherna Museum, Crete’s newest archaeological attraction. Opened in June 2016, this impressive museum houses exhibits discovered over a thirty year period in the surrounding area. The next stop is the Arkadi Monastery. There are still hundreds of working monasteries and convents around Crete and, as well as performing religious, social and educational functions, monasteries have been an important symbol of Cretan resistance during the centuries of Turkish rule. Arkadi is the best known because of the massacre which took place there in 1866. You then have time in the pretty village of Margarites which is famous for its pottery workshops still using ceramic techniques from the Minoan period. Arrival at your hotel in Rethymnon, where you have four nights half board accommodation, will be late afternoon. 100 miles today. Rethymnon has a pleasant beach and resort area, but by contrast with your first centre, is quite a large town, with 40000 inhabitants, including a sizeable student population. It has an impressive Venetian fortress and harbour, and some interesting museums. Day Five: Included morning walking tour of Rethymnon. Walk into town with your guide via the promenade through the charming old quarter to the Venetian harbour, and then through narrow streets and squares with Turkish and Venetian architecture. During this pleasant walk, you’ll see in a local workshop how the Cretan musical instrument, the ‘Lyra’, is made and, at a pastry shop, how to make the wafer-thin phyllo dough for traditional pastries. Days Six and Seven: At leisure in Rethymnon, with an included excursion to explore the varied landscapes of the west of the island. Your excursion to the west begins with a drive to Chania. The pearl of Crete, Chania, with its two harbours and historical city centre, is a little Alexandria in Europe. On a walking tour you see the covered market, the ghetto and Jewish, Christian, Muslim quarters of the city. The lighthouse of the king of Egypt Mehmet Ali stands at the entrance of the old city’s harbour. 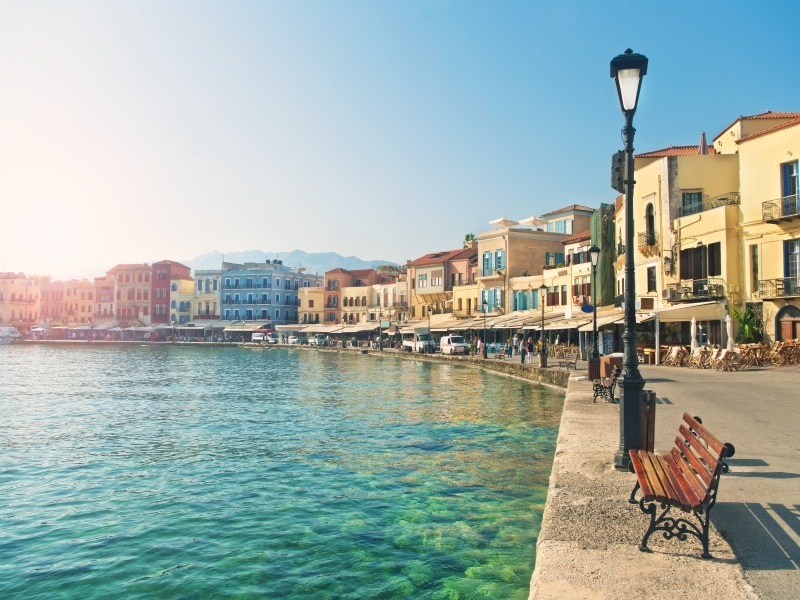 Chania, like the whole island of Crete, is drenched in history. From here you have a coach transfer to the Botanical Park and Gardens of Crete. Here you can walk the peaceful trails along the hill slope with herbs, shrubs and trees from all over the world. But don’t be late for your included lunch in the beautiful restaurant with magnificent views across to the mountains! 106 miles coach travel today. Day Eight: Free time until your departure for the airport, just over an hour away. Depending on flight timings, there may be time for some last-minute sightseeing en route. Please note: A new tourist tax in Crete will come into effect in 2018. The amount is not yet known, but it is expected to be 3 euros per room per night. It is not included in the price of the holiday and will be payable by hotel guests directly to the hotel.